It was a long weekend, full of way too much fun with good people and delicious food. And at the end of an exhausting Sunday, where I had gotten drenched by the NYC rain too many times, sort-of enjoyed THE ADJUSTMENT BUREAU and muscled my way through YogaX (the yoga version of P90X a visiting friend shames us by doing daily), I wanted to “eat the crap out of some sushi”. Enter Kamui Den. The best thing about eating sushi there is that the sushi is not the best thing on the menu. It is delicious – buttery soft with lots of ginger and mild wasabi on the site – but it’s the appetizers that win. Lotus Root salad, picked vegetables, tempura so light you can see the texture of the vegetables before you bite into them. 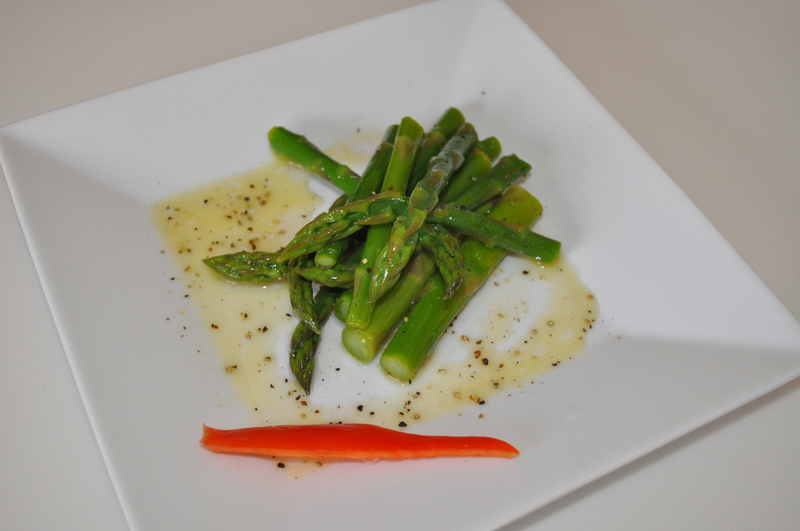 And a simple cold asparagus salad that my boyfriend boldly proclaimed to be the best asparagus he’s ever had. Thank god it’s a simple dish. The boyfriend can’t cook to save his life (sadly I think that’s a completely true statement) but the visiting friend (Tim) is an extremely able man in the kitchen. 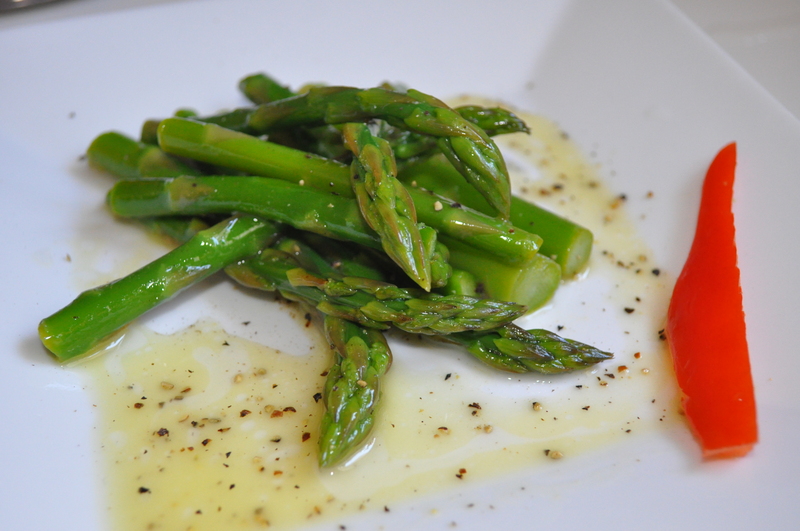 We agreed that the most likely way to replicate the dish is to flash boil the asparagus and then douse it in a cold water bath before drizzling on the simple sauce of lemon, oil, salt and pepper. Tim also pointed out to salt the crap out of the water – literally, so that it tasted like the Arctic. I knew it would help bring out the color of the asparagus, but didn’t know how much salt it takes to season vegetables in the boiling state. This morning I hit the train to Connecticut and stopped by my brother’s place, where he left me some Brussels sprouts and asparagus in exchange for checking in on his cat (it’s sort of endearing that he knows leaving me his unused vegetables does really make it that much easier to get a favor out of me). While my laziness enticed me to stick to my millet/lentil/get-my-tush-in-the-office plan, the desire to learn how to make this for someone I care about won over. And it’s really simple. Really. As in, he can make it. Trim the ends off of each spear and then cut in half, so that your pieces are about 3″ long. Bring a medium pot of water to a boil with a lot of salt… I estimate that I used about 2 tablespoons. While waiting for the water to boil, prepare an ice-water bath and make sure you have a colander ready. 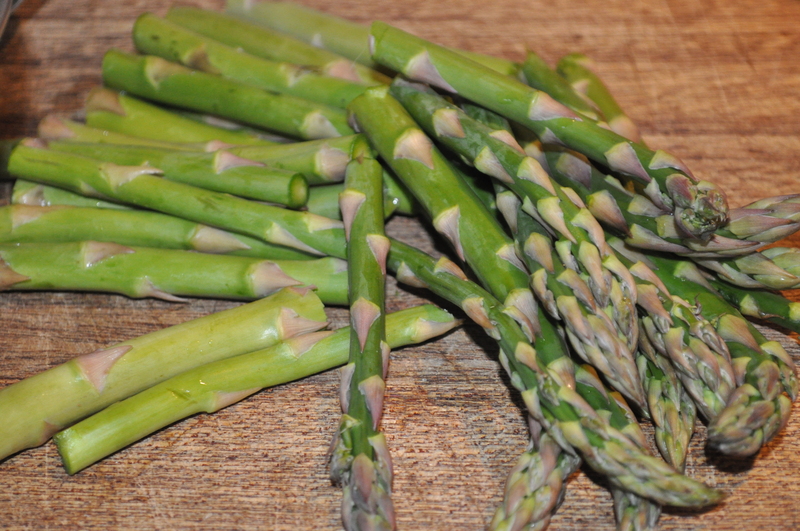 When at a roiling boil, drop in asparagus and cook for 1 1/2 – 2 minutes, until the thickest spear is soft enough to easily pierce with a fork but the pieces still have a lot of firmness to them. 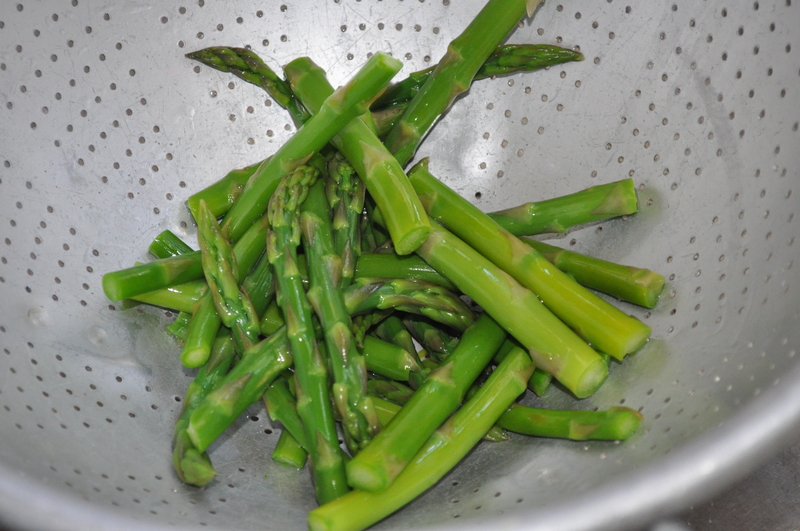 Quickly drain and toss in the ice-water bath, swirling the asparagus to make sure they’re all submerged.